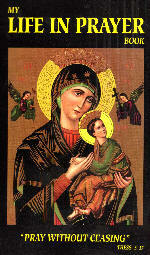 PRAYER TO OUR DEAR MOTHER OF PERPETUAL HELP. Let me be forever Thine. Mother�I trust and confide in thee! Mother�I send up my sighs to thee! Mother�assist thy poor child so weak! Mother�protection and strength I seek! O Mother�come, help in my combat each day! O Mother�come, teach me to suffer like thee! O Mother�yes, come, be forever with me! Yes, thou canst help me, most Powerful one! Thou shalt sustain me, most Merciful one! Thou must assist me, most Faithful one! O yes, thou wilt aid me, most Loving one! Mother of grace, the joy of our nation! Refuge of sinners, the gate of salvation! Hope of the exile, God's work of perfection! Comfort in sorrow, our mighty protection! When hast thou forgotten the prayers of thy child? "Sweet Mary will aid me, Mother so dear!" "O Mary, assist me, in life and in death!" "My Mother will meet me in Heaven today!" The Archconfraternity of Our Lady of Perpetual Help and St. Alphonsus is established at this Church. 1.�Advantages. The special protection of Our Blessed Lady in life and in death. Many plenary and partial indulgences. 2.�Obligations. None that bind under sin. The following practices are recommended; to wear a medal of Our Lady of Perpetual Help; to have her picture in one's room; on Wednesdays if possible to visit the picture in our church, which is an exact copy of the miraculous image in Rome; in all spiritual and temporal necessities to invoke the help of Our Blessed Lady.